Oceanfront, well maintained 7 Bedrooms, 7.5 Baths quadplex at the popular "Rainbow Row" - a landmark on OIB. Spacious living area, with kitchen, dining and living room opening to outdoor oceanfront deck. Keuring. Wet bar and wine cooler for added enjoyment. Powder Room, Dishwasher, Washer/Dryer, Microwave, 3 Color Cable TVs, including a 55" smart TV in the living room with a BluRay player and Netlifx, local and domestic long distance phone services provided. Two oceanfront master suites; with King bed, TV and oversized bathroom with whirlpool bath and shower . The second master has a King bed with oversized bathroom and private deck. Third floor with vaulted ceiling has a Queen and 4 twin beds, private bath. There is a third floor sitting area with a 55" smart TV and BluRay player and Netflix. Swimming pool shared by the quadplex. Outside Shower (not enclosed), charcoal grill, sundecks and covered porches. Non-Smoking and No Pets. Bedding: Downstairs: Queen, Queen Upstairs: King, King, Queen, Queen. Loft: 4 Twins, Queen. All beds made upon arrival and bath linens provided for your stay. We love coming every year to this incredible house with our youth group. It is large enough for my group to have plenty of space for our group meetings and plenty o sleeping areas.The kitchen is well stocked with enough equipment to cook for 20+ people. The updates from the previous year have made the place totally amazing. Even after two major storms, the owners have really maintained the house incredibly well. It is a perfect large sized rental located directly on a beautiful beach! We are already looking forward to returning next fall! 5th year in a row! This was the 5th year in a row that my family has rented this condo! The view and unit are both absolutely amazing!! Every year we have stayed at this unit, something new has been done on the inside. New flooring, new painting, new beds, new big screen TVs....the list goes on and on. This will certainly be a continued family vacation spot for many years to come. Renting this unit is something me and my family look forward to every year!!! Our family spent our Christmas 2017 holiday at this special place. The owners are in the process of redecorating/redesigning the entire space, with new paint, beautiful art, bold contemporary mirrors, quality bed linens, gorgeous lamps and bath accessories. All of the wallpaper, (which had become a bit dated), in the kitchen and baths has been removed, and the walls are freshly painted. The new color scheme is perfect. Everything is very tasteful, light and airy. Thank you for putting so much thought and work into our favorite getaway! A beautiful job, very well done! We had an incredible stay! We brought 18 folks and slept and showered everyone with out any issues at all. We love the beach from and the pool was an incredible option for us. The house was very clean and well kept. We had everything we needed for a group and for a lot of cooking meals! We look forward to returning again in the future. We absolutely love staying at this special place. The condo is spacious and clean, well-appointed and lovely, and it is apparent that the owners have put much thought into comfort and convenience for their guests. The ocean views are splendid. We always leave feeling restored and a bit happier. 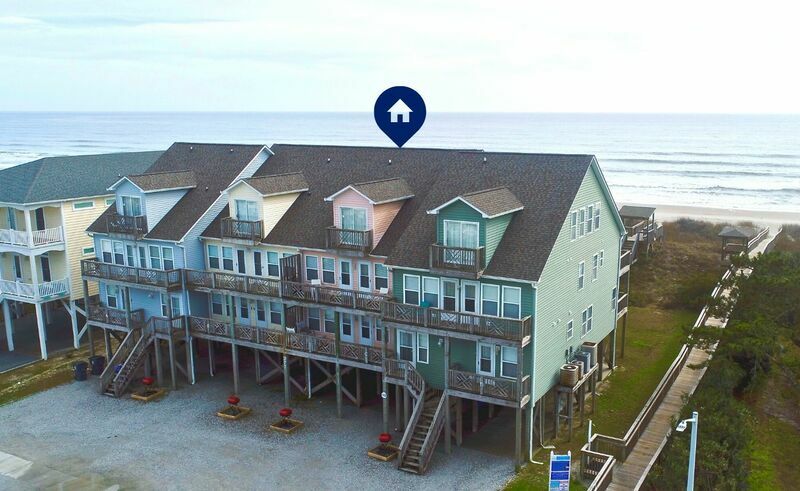 A getaway at Rainbow Row at Ocean Isle Beach always seems to be exactly what we needed. We love it, recommend it and hope to return again and again!!! Expansive views from three levels, only foot-steps from expansive, pristine beach. House decor is stunning, with privacy even for large groups and a fully equipped kitchen. Lovely private pool and easy access to shopping. Ocean Isle is charming with an intimate, historic Carolina beach feel. You'll want to return every year! Fantastic stay for our large family! Our very family had a very comfortable stay, with plenty of room for us all! The beachfront condo was so convenient, being a few steps away from the sand is ideal, especially with children. We also really enjoyed the pool, that was such a bonus! The kitchen was plenty large to prepare meals, and the open dining room into the living room was ideal. We will definitely be coming back! Very clean and lots of space! We enjoy going here every year with our best friends and their families and this place couldn't be better! This is a great place to stay The beach is just steps from the back porch via a well maintained boardwalk. The ocean view from the back porch and the 2nd floor sun deck are awesome We loved the feel of the ocean breeze and the sound of the waves breaking on the beach. In addition to the beach being steps away, this Condo Unit also has a pool Each bedroom has its own full bath a huge bonus, and theres a half bath located on the main floor near the den/living room comfortable, new furniture had recently been purchased. The top floor is very spacious, with a bedroom 2 double beds and full bath, plus open space for playing games or just hanging out. The kitchen is well stocked and the entire Condo was clean and well-maintained. This oceanfront condo is wonderful. Went on girls weekend. Each bedroom has its own full bath. Nicely decorated. Kitchen very well stocked. Very well maintained, clean and comfortable. Being ocean front and having a pool was a huge plus. Will definitely be back again.